Are you a senior preparing for transition? Try looking in the mirror. Are you considering a transition of leadership to the next generation in your family enterprise? 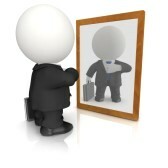 When is the last time you looked in the mirror? I mean really looked in the mirror. When is the last time you asked yourself who you are and what you stand for? So often, as we prepare for a transition, we focus on the tasks and details that surround us. We focus on everything except for ourselves and our own needs. Those needs can go deep – way beyond the economics. They may be there on an emotional level, relationship level, philanthropic level, and more. The better we understand who we are and what we need and want in order to provide ourselves security, contentment and personal fulfillment, the better we’re positioned for the significant changes that the transition can afford. So take some time to reflect and create a personal balance sheet that expresses your values and priorities. Your needs may emerge from the gaps. Work with your spouse and even your children on this. Let them know your desires, concerns and expectations. They can help you.